Situated in eastern Gansu province, Gangu is not one of China’s most attractive towns, in truth it is quite ugly. 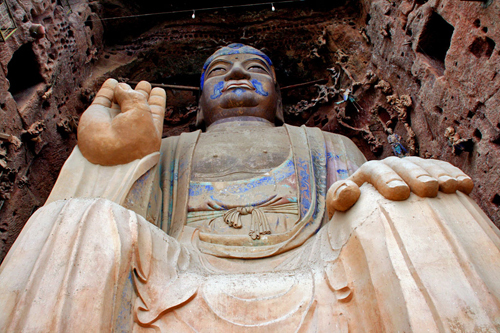 However, if you are in Tianshui visiting Maiji Shan and have a day to spare, the large 23 meter moustached statue of Sakyamuni a few kilometers outside Gangu is well worth visiting and can be easily combined with a trip to the beautiful Water Curtain Caves near Luomen. 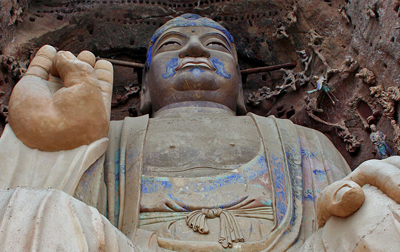 The Sakyamuni statue, sculpted at the height of the Silk Road’s importance during the Tang Dynasty, is approached by climbing a temple lined trail on Daxiangshan大像山. While none of the temples are spectacular, they are quiet and peaceful. You and a handful of pilgrims will be the only people on the trail even in the middle of August. The statue itself is quite special. The colours are vibrant and the decorations surrounding it unique. 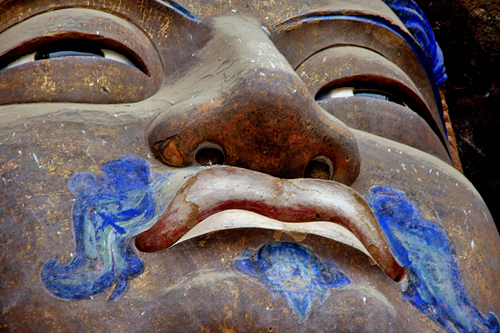 But what stands out is the blue moustache, something almost unseen in the rest of China. There are some good views towards the rising Loess Plateau as you climb the trail. You can get to Gangu from Tianshui 天水 by train in just over an hour. The convenient K377 leaves Tianshui station in Beidao 北道 at 8.32 and costs 13 hard seat (buy your ticket the night before, there where plenty of seats available). 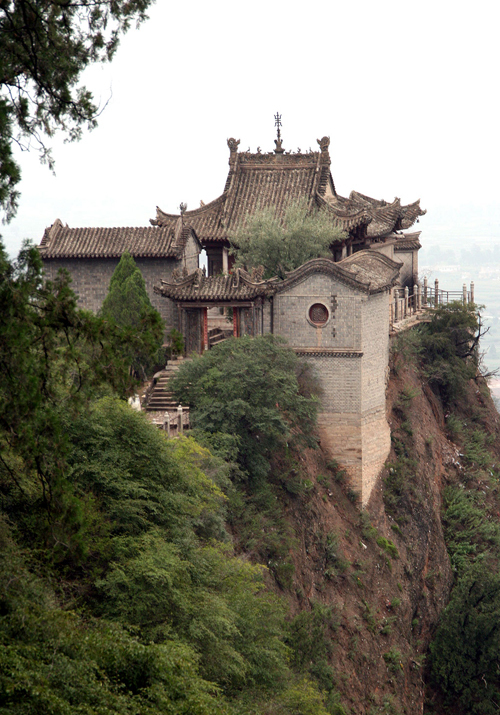 Alternatively you can take one of the frequent buses from Tianshui’s twin town Qincheng 秦城. I’d recommend combining a visit to Gangu with the Water Curtain Caves (Shuiliandong 水帘洞) near Luomen 洛门 some 60 km away. Hiring a taxi for the best part of a day from in front of Gangu train station costs 200 Yuan after a little bargaining. However, I don’t recommend visiting The Water Curtain Caves until restoration work has finished sometime next year (read the next posting).